1. All CONNECTORS OVERMOLD VIOLET PVC. 6. 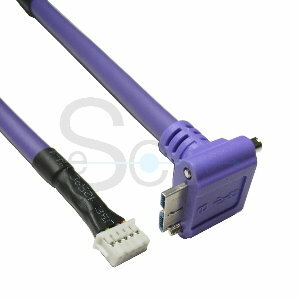 (26AWG*1PAIR+EAM+S+FEP TAPE)*2PCS+(26AWG*1PAIR+A)+24AWG*2C+AS+FEP TAPE, OD:7.0MM, VIOLET PVC JACKET UL2725. (b)INSULATOR RESISTANCE: 20M ohm MIN, DC300V 0.01sec. (c)CONTACT RESISTANCE: 3 ohm MAX.